Community Development Corporations (CDCs) are nonprofit, community-based organizations focused on revitalizing the areas in which they are located, typically low-income, underserved neighborhoods that have experienced significant disinvestment. While they are most commonly celebrated for developing affordable housing, they are usually involved in a range of initiatives critical to community health such as economic development, sanitation, streetscaping, and neighborhood planning projects, and oftentimes even provide education and social services to neighborhood residents. 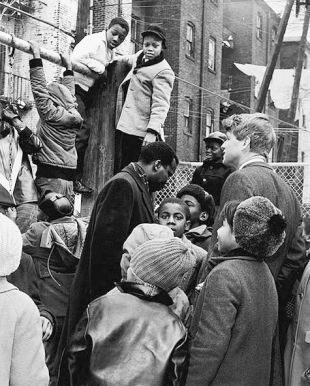 Motivated to action following a tour of Brooklyn’s marginalized Bedford-Stuyvesant neighborhood in 1966, Senator Robert Kennedy proposed supporting CDCs to catalyze community-based physical, economic, and social programs aimed at improving neighborhood conditions. Believing in the model’s potential, the Ford Foundation and federal government invested millions each in such organizations—investments that enabled these enterprises to flourish across the country as people sought new ways to fight urban poverty. They anchor capital in communities by developing residential and commercial property, ranging from affordable housing to shopping centers and even businesses. At least one-third of a CDC’s board is typically composed of community residents, allowing for the possibility of direct, grass-roots participation in decision-making. CDCs’ work to enhance community conditions oftentimes involves neighborhood organizing, a process critical for empowering residents and gaining political power. Our Support Organizations section features major organizations working to advance community development work across the nation. Here, you can find out more information about those assisting CDCs, including three important intermediaries: LISC (Local Initiatives Support Coalition), Enterprise Community Partners, and NeighborWorks America. Our Best Practices section showcases exemplary CDCs from across the country working to affect positive, sustainable change. For instance, one such organization is New Community Corporation in Newark, New Jersey. One of the largest CDCs in the U.S., it employs more than 600 community residents, manages 2,000 housing units, and serves more than 50,000 community residents a year through its comprehensive healthcare, social service, job training, education, and arts programs. Our Research Resources section highlights some of the best web-based resources focused on community development. For example, the LISC Online Resource Library is a searchable database through which users can access and download hundreds of publications. Our Articles and Publications section includes links to a diverse selection of articles, reports, papers, and books focused on community development. One such report is Karen Black’s Collective Strength: The $3.3 Billion Impact of Philadelphia Community Development Corporations (December 2012), which provides a clear snapshot of the potential of CDCs to affect positive community change by documenting the collective economic impact of CDCs within Philadelphia. Our Tool Box features top-notch resources designed to help on-the-ground practitioners working in the community development field. For instance, the NACEDA Communications Toolkit is a guide specifically designed to help community development practitioners describe and promote their work to a diverse range of stakeholders. And, lastly, our Policy Guide provides an overview of related federal initiatives and programs that can help practitioners leverage resources and increase their impact. For example, Community Development Block Grants (CDBG) have been a critical source of funds for expanding CDC activities.